It’s been a little over a month since my last post. I don’t know where the time has gone. I remember when I was in grade school I felt like time went by so slowly… but now the day fly by so fast. It’s so funny how our perspectives change as we get older. Yup you don’t want to go in there and neither do I. Guess we will have to wait until we move to tackle the storage unit. Couple of weeks ago we closed on our new house!! We are so excited! Don’t get me wrong I love my little studio apartment in my parent’s basement, but live out of boxes is ANNOYING! 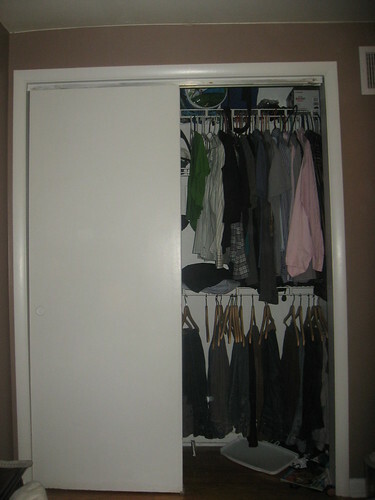 I want to be able to open up my closet and see all my clothes hanging in there. So back to the house. We haven’t moved in yet, we are hoping this will happen sometime in the beginning of April. We had to get some work done before we moved it. So lately its been non-stop lately with trying to get everything planned out and getting everything ready to move in. Of course the day of the closing we went and picked up some new locks to put in. Unfortunately Jimmy had to go to work after that. After work we went to the house and started to tear up all the carpet and tiles!!! But more about that later. 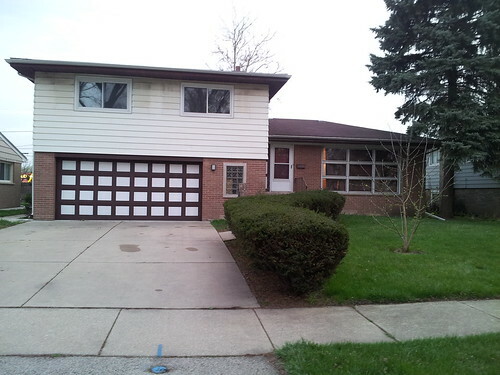 Here is a picture of our new house. It other news we finally heard news about the outsourcing of my job. I feel like its been up and down for such a long time. That I just had to hear a decision. We have been praying non-stop that God would protect my position. I had to let go of the situation and just wait and trust God. So after going back and forth they finally decided that it would be better NOT to outsource our jobs. WOOHOO!! God answered our prayers!! I know one thing: that nothing is certain in this world but God. I can’t believe that I have neglected my blogging for so long. It’s not that I forgot I had the blog, but just finding time to sit down. Since my last post a lot has changed. I think this would just be a good time to just let you know what is going on. The next major change in our life has been moving out of our townhouse after 10 years! After putting our place on the market we received an offer within 5 days. God has been really good to us during the whole process. I am still amazed at how everything went so smoothly. Of course with the sale of our place we decided that moving in with my family would be the next step. When I asked my parents they were like WHAT we don’t have room for all of you. My parents being the loving parents they are agreed. It is definitely a full house. In the mean time we are looking for a new house to make our home. We thought that moving into my parents house would be really difficult for all of us. The thought never occurred to us, a house that I lived in and called “home” for about 7 years and then left for 10 years when we got married would ever be a place I would come back to live in and call “home”. My parents have said, “this isn’t my home, it is our home”. I have to agree this will always be my home. Sure we all have our moments and adjustments but it has been great. I have a greater appreciation for my parents and my sisters. I guess I have matured a little bit. Within a week of moving in I hear news at work that they are looking into outsourcing my team. The big guys at work have received several bids from outside companies. So we will know in about 2 weeks if it will really happen. My company has been laying off people for about 3 years. It has been an emotional roller coaster. Seeing people you have worked with for so long leave and being afraid that I would be the next to one be let go. But through all of this we have learned so much. We learned that one thing is certain and will never change and that God is always faithful. He will never change even when we are and everything around us is changing. He is will always there to work everything out for our good in His perfect timing. That all we ever need to do is trust God. With us moving and live out of boxes at the moments project have been at a stand still. My post might be a little sporadic as well while we transition. We will try our hardest to post as much as we can. Flew to NY for a wedding. Luke was the ring bearer… not to mention the cutest one I have every seen. Came back to Chicago to find out that Luke’s school was closing(heartbreaking news). Scrambling to enroll him into another school. School year ending… which was so sad to see. But so thankful that Luke was able to be there for 2 years. Touring new schools left and right. Jimmy and I celebrated our 10 year wedding anniversary(can’t believe it). So thankful for him in my life. Our basement flooding after a big storm. Crafty mode while making centerpieces for my cousin’s engagement. Family came in for my cousin’s engagement. …. and it goes on and on. Not to mention all the things in between. Don’t want to bore you with all the details. Do any of you have kids that are able to dress themselves or have an opinion on what they want to wear. Sometimes it turns into a battle when its time to get ready. Usually it ends up causing a mess in their room. 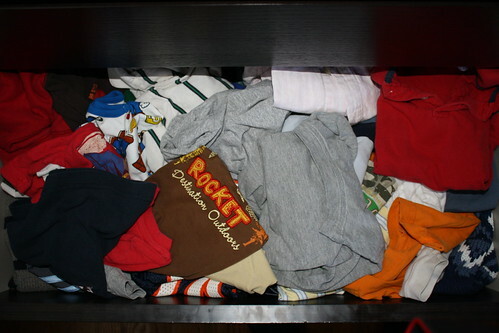 I know with my boys they like to dig around in their dresser drawers to find something to wear. They actually know what they want to wear but just can’t find it. I have the same problem at times. If you don’t have that problem consider it a blessing. When it comes time to doing the laundry and folding the clothes… I’m the lucky one. I do it most of the time. I hate folding, actually hate is too strong of a word I dislike it very much. Not to mention it gets me irritated when I go to put the clothes away and the dresser drawers are a complete mess. Everything that was just organized is all over the place and not longer properly folded. I really like to have my clothes folded the way you see a neatly stocked clothing store. I guess it has to do with working in retail. Probably also the reason why I can’t shop in a messy store. 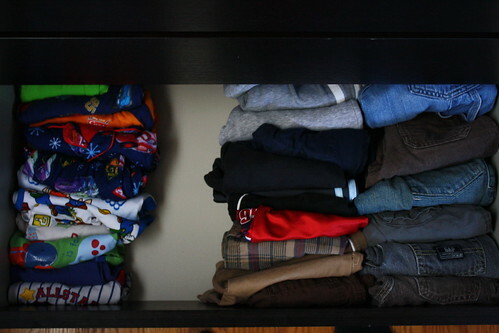 When your shirts and pants are folded that way its hard to see what is below all the other clothes. It works for a clothing store cause they stack all the same shirts are in a nice neat pile. While I was putting away all the folded laundry in the kids room I thought it would be a the perfect time to organize their clothes. Their drawer looked like the whirlwind of what our life consisted of the past several weeks. While flying to NY I read in a magazine that the best way to pack your clothes is to roll. I’ve heard this before. The article stated that if you roll your clothes you end up having more room and less wrinkle. Of course I packed our luggage this way on our trip back to Chicago. It worked great especially since we had clothing and shoes for the 4 of us packed into 2 carry-ons. We ended up with more room. This was definitely a blessing since the plane on our way back was so small that you could barely stand straight in. The flight attendants ended up walking by everyone at the gate to check their carry-ons. They gave a red tag to everyone they felt had a too big of a carry-on and told them the would have to check it before boarding the plane. Lucky for us… we weren’t one of them, since our carry-ons had enough room this time around. What do you think? 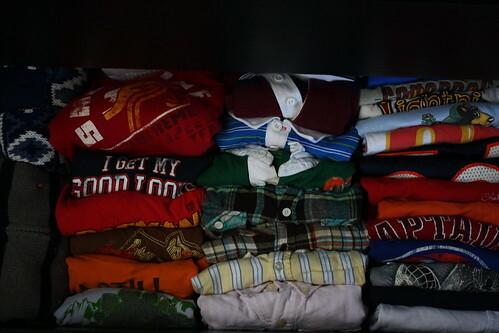 I just folded them like I did before but folded the shirts in half and rolled their bottoms. Its been more than a month and the drawers look the same. I can’t complain and the boys love that they are able to see each piece of clothing before taking it out. I haven’t had to re-fold anything!! Jimmy and I are happy parents when it comes to getting the boys ready now. Not to mention they have a lot more room to grow in the drawers. I don’ t know if you read our post about Luke’s present for his teacher. Well if you didn’t, I hope you have some time read the first post about teacher appreciation. As you know we couldn’t leave out the other teachers’ presents. Luke has 5 other teachers that he has classes with. I am a huge fan of personalized gifts… not to mention I love cute magnets. There are a lot of different magnets out there. You have probably seen those glass magnets out there. I love the designs they have in between the glass and the magnet. We decided that the magnets would be a good idea because they could use it at home or in their class. 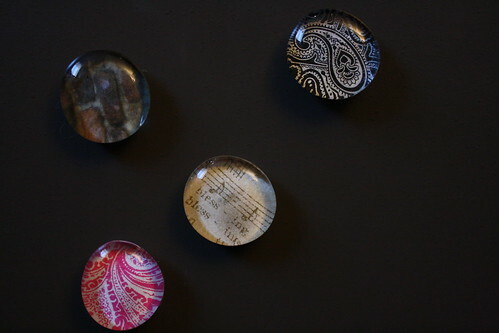 I knew I could use the glass marbles that are used in vases to make these magnets. I also knew I could used scrapbook paper for the design. 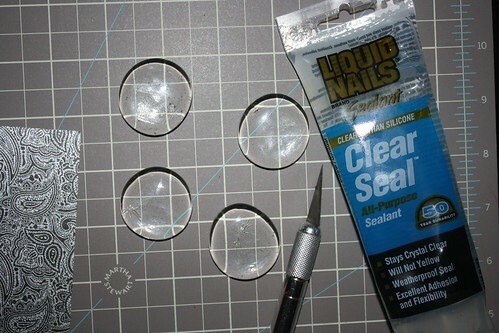 The thing that I didn’t know what to use to glue the paper to the glass marble. I went to Micheal’s and Joann Fabrics. Trying to find the right glue. Of course when I asked the sales associates in the store they didn’t know what to suggest. So I figured I would google it. One tutorial said to use silicone glue. No clue what that was, but knew I was not finding anywhere. I came home with some crazy glue that one of the sales associate suggested. Tested it, and guess what…. It didn’t work. I talked to Jimmy to help me figure out what to do… I told him that I needed silicone glue and he was like, “I have that”. HELLO!! Why didn’t I ask him before I left to search for the glue. Below is a picture of what we used in this project. I had some leftover scrapbook paper from other projects so I decided to use them. We printed the teachers names on the scrapbook paper. 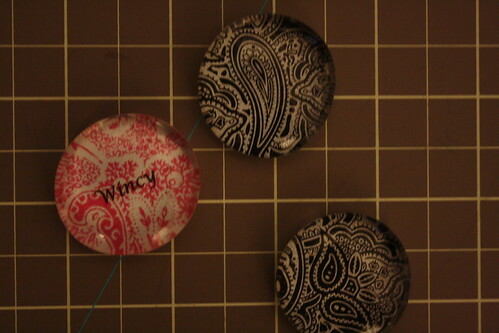 Then put a dab of silicone glue on the glass marbles and stuck it to the sheets of paper. When pushing down on the glass marble I made sure that the glue covered the whole area of the glass marble. We let the glue dry for a couple of days. Then cut around the glass marble with an exacto knife. 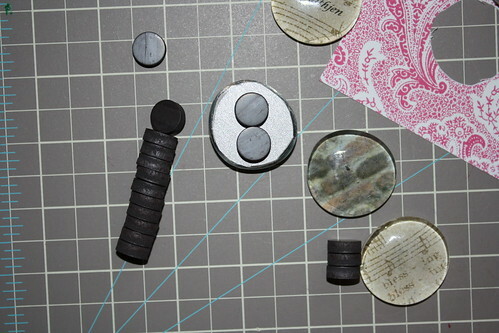 Then used the hot glue gun to glue the magnets to the glass. We ended up putting 2 magnets on each of the glass marbles. We wanted to make sure that it wouldn’t slide down. Luke loved helping out with this project. Don’t worry I didn’t let him go near the exacto knife. He just helped with the gluing. Luke also put a little note for each teacher with the magnets. Here’s a couple of pictures of how they turned out. I hope the teachers enjoy them. We loved them, so we made some for us as well. 😉 What do you guys think?? I love taking on craft projects. I usually don’t realize how difficult or time-consuming something will be. All I know is that I want to do it. My family would tell you that I have so many ideas and that I want to do all of them at the same time. I am not able to just pick one. We got an email from one of the room mom’s for Luke’s class, stating that it was teacher’s appreciation week. They wanted us to make cards/gift for the teachers. They said not to spend money, but to be creative. Lately I have been really loving a site call pinterest. It’s a site that you can bookmark all the different pictures you see online and categorize them into groups that others can see as well. While I was on pinterest I saw a picture of a craft that someone had made for a teacher. 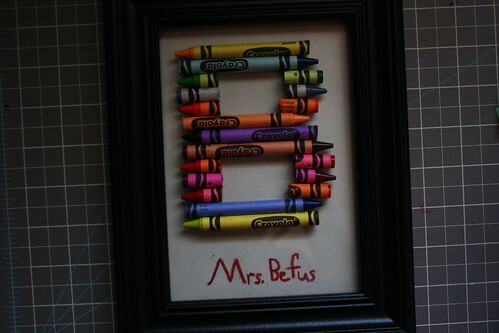 It was picture frame with the teacher’s initial in it and it was made with crayons. You probably have no idea what I am trying to say. Click here to get a better idea I am trying to explain. I showed this idea to Luke and asked him what he thought about it. He told me he wanted to give one to each of his teachers. He said he didn’t want any of the teachers to feel left out. I would have loved to, but it would have taken too much time…. maybe we can do it again for an end of the year present. We did make something special for the other teachers. But I will have to show you that another time. This project does take some time and is very inexpensive. Construction paper/card stock the same size of the picture frame. We printed 2 sheets with the letter B on it. We put one of the sheets to the side while we cut the B out of the other one. Arranged the crayons to your liking on the table. This is how we arranged our crayons. 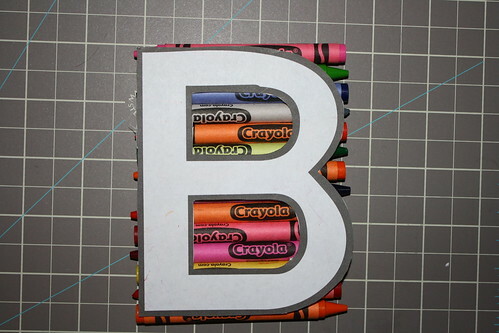 Then took the B that we cut out and laid it on top the arranged crayons and marked where we would be cutting the crayons. Only cut the middles of the crayons. Don’t cut the tips off. I think it looks better with the ends. The cutting of the crayons should be done by an adult. Jimmy was the designated crayon cutter/slicer. 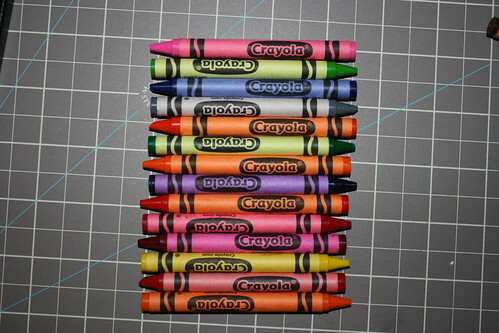 Take one crayon at a time to cut so that you know where you are placing the crayon. Using your blade or knife start cutting the crayons where they are marked. Jimmy rolled the crayon while cutting it to get a more exact cut. After you are done cutting all the crayons, see if you like how the crayons are arranged. You want to make sure that the crayons look like the letter. If it doesn’t try arrange it and align it properly and cut of any excess ends. Take the glass out of the frame. Take your template you put aside and place it on the table. Then put the glass from the frame on top of it. We like the idea of gluing the crayons to the glass instead of the paper. Once the hot glue gun is warm we put glue on the crayon and placed it on the glass. The glue dries really fast so make you are fast and precise when placing the crayons. Luke was able to place the crayons that were easier to do. I had Luke write his teachers name on a piece of construction paper with a pencil. Afterwards, he went over it with a crayon. When you are done put the construction paper with the teachers name in the frame and put the glass with the crayon initials on top of construction paper. Voila!! Your done. Leave a comment on this post we would love to hear what you guys think. Of course questions are always welcomed as well. We are probably one of the last people to get a flat screen TV in our house. We could never really justify spending the money on a new TV. So we never really went out looking for one or buy one. I mean, who wouldn’t want a flat screen TV in the their house?? Well if you don’t watch TV I guess you wouldn’t want one. The best thing about a flat screen is that fact that it doesn’t take up any room. 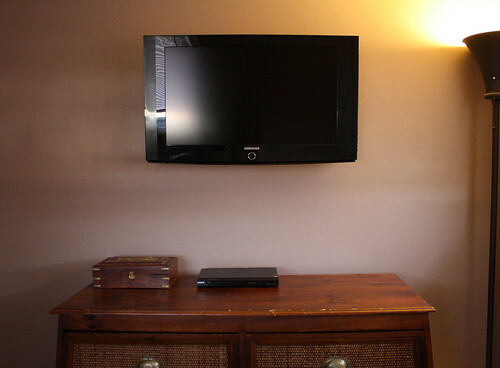 When you live in a small place a flat screen TV makes a difference. I was a little upset. You wives know how husbands are… they say they are going to do something and it never gets done. Then they finally get tired of the nagging and start to work on whatever they said they would do. Sometimes it gets done and sometimes it gets done halfway and sometimes it doesn’t even get touched or looked at. This TV sat in our house for a couple of days. Then one day Jimmy came home from work with some tools and parts. Within minutes he had the TV open and the power supply board out. 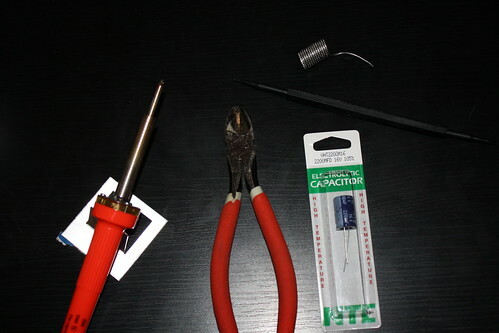 He sat in the living room with a soldering iron and power supply board in front of him. He examined the board. 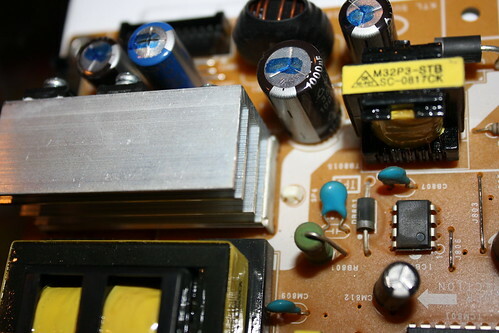 He saw that one of the capacitors was slightly raised. Trust me when I tell you this, when I looked at it I couldn’t even tell what he was talking about. He took that piece off and replaced it with a new one. This probably took him a total of 30 minutes to complete. I was surprised when we put it all back together it actually turned on. I was reminded that day to never doubt him. Yes even after being married for almost 10 years I still forget that he is able to do things that some just would never even attempt. The TV that Jimmy brought home was a Samsung. After Jimmy did some research he found out that Samsungs are known for having this problem. All you people who own a Samsung TV please don’t throw it out, save your money and fix it. I did a little research on what it would have cost to buy a brand new 32-inch TV. It would cost anywhere from $379.99 to about $700. 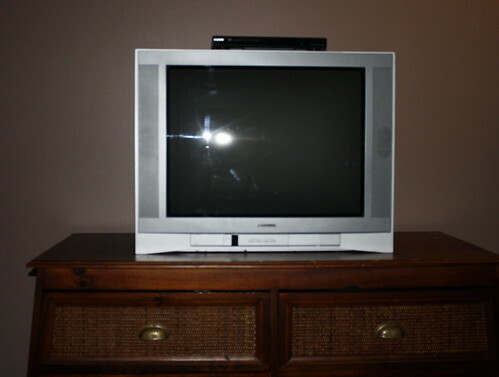 For this TV we spent $2.50. Can you believe it? I couldn’t. Now that’s a steal. I think this is the best DIY project ever. Can you guys beat that price? It has been a while since the last post. Please accept my apologies. I will try to be more on top of posting on a regular basis. So Jimmy and I completed this project about a year ago, and I’ve wanted to post it since we started this blog. Of course when I went to look for the pictures they were nowhere to be found. I thought it might have been on our hard drive that crashed a little while ago. But realized it was still on our old computer. I finally have the pictures to share with you. A while back Jimmy got a call from one of our neighbors asking for help putting together an Ikea wardrobe. After we went over to help we kind of wanted one as well, but we didn’t know where we would actually put it in our room. So we decided against it, at least for the time being. Of course when we get an idea in our head it never goes away forever. We decided to hold off on the wardrobe idea and move our efforts to our office (come back for that post). We decided to go to Ikea to get a desk and some shelves for the office. While we were at Ikea we decided to look at the wardrobes they had available. After walking around, we knew we wanted one for sure, but it was really out of our price range, which kind of put a damper on our idea for the wardrobe. Since we were at Ikea for the office, we went and got what we needed for that project. As we were walking to check out we saw the AS IS section!! We got really excited because we saw a few thing in the section we could really use for the wardrobe. We knew we had to come back when we decided what to do with the wardrobe idea. We didn’t have the room for the wardrobe in our bedroom so we decided to put the wardrobe in our closet. We have a closet that has 2 sliding doors. The inside of the closet had wire shelving. 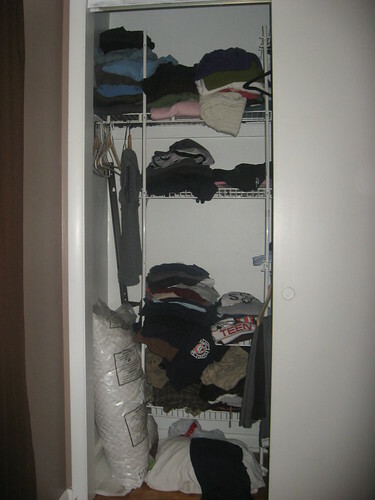 On the left side we store all the clothes that were folded and hung the clothes on the right side. It was a horrible mess. We hated the fact we couldn’t find anything in it… or that it took forever to find something. We measured our closets and looked at the Ikea catalog to see if we could fit one of their wardrobes in our closet. Lucky for us our closet was the right size for the wardrobe. So we went back to Ikea to check out the AS IS section. We were able to find one part of the wardrobe. In the AS IS section all the items are already put together. Some of the items have scratches, dents or cracks. If you ever buy something AS IS just make sure that you can fix it or if you will be able to see the imperfections. Also everything is already built so make sure you bring a vehicle that is big enough to hold the item. Ikea doesn’t allow you to hold anything that is As Is. We bought the first half of the wardrobe and stored it in our basement since we didn’t want to start the project until we had everything we needed. We weren’t sure how often Ikea put items in the AS IS sections. So we went back again a week later and saw the other half of the wardrobe that we needed. We also bought a couple of drawers and shelf and went home. We started the project the following day. It was difficult but great. 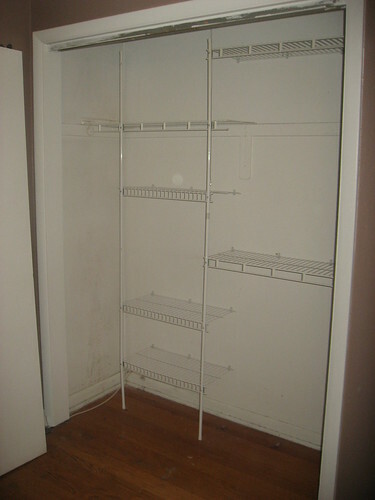 Here is a picture of the closet before and after we took out the wire shelving. The next job was trying to fit the wardrobe into the closet. The measurement of the inside of the closet and the wardrobe with both pieces were pretty much exact with maybe 4 inches total of wiggle room on the side. 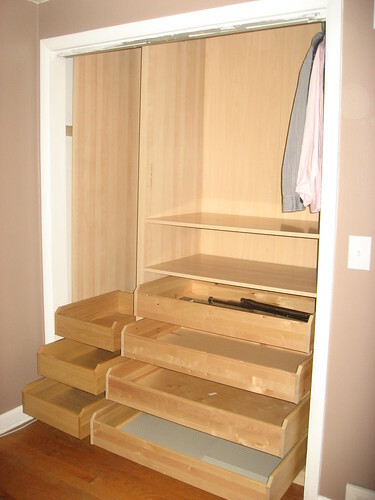 This made it difficult to just slide the wardrobe into the closet. 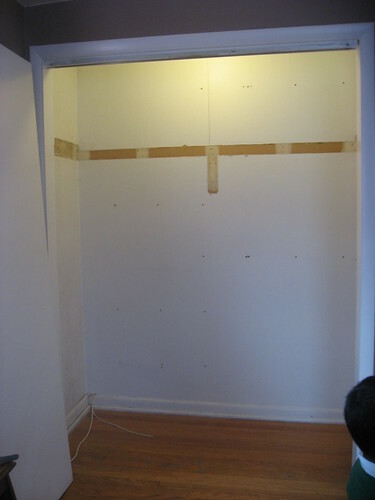 The only thing we could do was take the whole wardrobe apart and build it inside the closet. That didn’t work either. We ended up cutting about 1 inch off the height of the wardrobe so that we fit it inside the closet because the height of the wardrobe and closet were the same. Jimmy cut down the height of the wardrobe about an inch. He made couple of holes on the top piece of the wardrobe to put the lighting it. Since the lighting we had in the closet had a pull cord. Jimmy attached the lighting and wired the light to have a switch we could turn on and off. Then we took the top piece and screwed it back to the 2 side pieces. 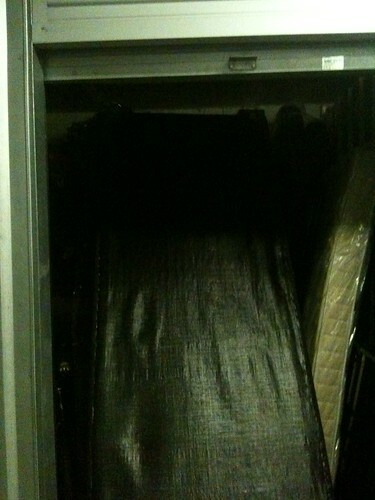 We also attached the backing of the wardrobe to the 3 pieces. We put in the bottom piece of the wardrobe in the closet and then put the top piece in and Jimmy secured it to the 3 other pieces. Then we did the same thing for the other side. 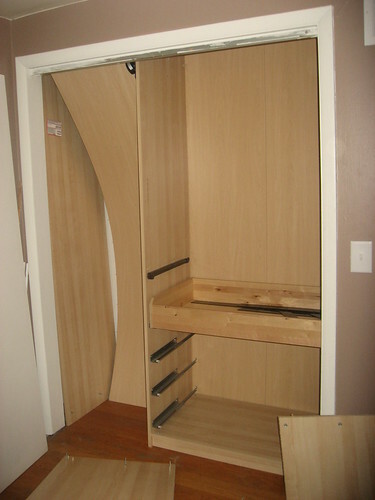 It was really difficult to put everything in the closet and to build it because there wasn’t room for the tools. Of course it took quite a bit of shifting and force but we were able to put the wardrobe in the closet. I wish I had pictures of us struggling to get it into the closet it would have been funny to see. All I have to say is, where there is a will there is a way. Here is our new improved closet. We love it!! This project cost would have cost anywhere from $850- $1000+ but since we are always looking for a deal we only spent $220. We added a few things to the closet since we finished this project. I will post pictures in a later post. Now that is what you call a steal!! What do you think?? We learned a lot from this project and we would to love answer any questions.